90 kittens are set to battle it out for the ultimate prize. Good news for cat enthusiasts: the Kitten Bowl is returning to the Hallmark Channel. According to Hallmark's website, the event will be hosted by Beth Stern, television personality and spokesperson for the North Shore Animal League America, and sportscasters Mary Carillo and John Sterling, will serve as the play-by-play announcers. The "players" will be 90 adoptable kittens, provided by the North Shore Animal League America and Last Hope Animal Rescue and Rehabilitation, and various celebrities and entertainment personalities are invited to the game. Last year, 1 million people tuned into the first Kitten Bowl and all 71 of the "players" got adopted. 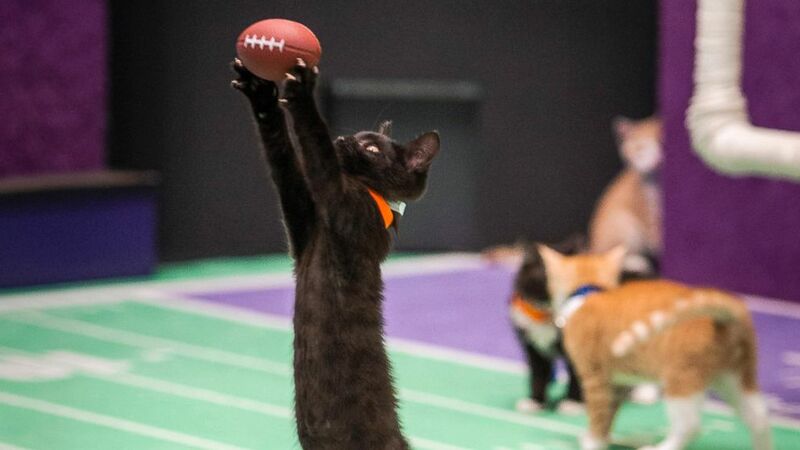 (Menachem Adelman/Crown Media Family Networks/AP Photo) Kittens playing football in a scene from the Hallmark Channel's "Kitten Bowl II," airing on Sunday, Feb. 1, 2015, 12 p.m. ET/PT, 11 CT.
"Kitten Bowl II" will start with two semi-final matches between the Northpole Panthers and Hallmark Channel Hearties, and the Good Witch Wildcats versus the Hallmark Movies & Mysteries Mountain Lions. Then, the victors will play each other to determine the champion team. In addition to playing with the classic mini-footballs in a mini-football stadium, the kittens will be dealing with obstacles and traditional cat lures, such as yarn and laser pointers. The adorable game of "football" is set to air Sunday on the Hallmark Channel at 12 p.m. ET before the Super Bowl - and Animal Planet's 11th annual Puppy Bowl - air later in the day.